Florida scrub lizard, photographed at Jupiter Ridge Natural Area, northern Palm Beach County, March 2015. Most of the lizards usually seen in Florida are imports, brown anoles and curly tails that have managed to outcompete the natives and drive them to the edges of their normal habitats. They're so numerous that the temptation is to ignore it when you see a lizard. You just assume. But when you do look, occasionally you'll come across something like this guy, a Florida scrub lizard, Sceloporus woodi. Not only is it a Florida native, it's only found in Florida. Unfortunately, it's also becoming an increasingly rare sight. Scrub lizards are on the small side, growing to about five inches long. Their bodies are gray or brown, with a dark brown stripe running down each side from the neck to the base of the tail. Males have a turqoise patch on their bellies (you can see it in the top two photos) and black spot on their necks. Females might have a faint turqoise patch. As you might guess from the name, they're denizens of scrub, sandhills, scrubby pines and the like. They require a lot of open ground with plenty of bare sand and a light canopy of scrub oaks or young scrub pines. Dense vegetation is not their friend. They spend their days perched low on tree trunks, foraging on the ground or basking in the sand. Dinner includes insects, spiders and other bugs. Females might lay between three and five clutches of two to eight eggs each during the course of the year. Eggs layed in April might take as long as 75 days to hatch; eggs layed in the warmer months require less. In any case, it takes 10 or 11 months for a young Florida scrub lizard to reach maturity. The International Union for Conservation of Nature classifies the scrub lizard as "near-threatened." The Florida Committee on Endangered Plants and Animals lists it as threatened. However, it has no legal status either at the federal or state level. The problem for the scrub lizard is declining habitat. There isn't as much scrub as there used to be, and the quality of what's left is in decline because of fire suppression. Fire creates the open space the lizard requires; sans fire scrub becomes overgrown and unsuitable for this animal. Moreover, the scrub lizard has limited mobility; it can't easily repopulate newly cleared areas. 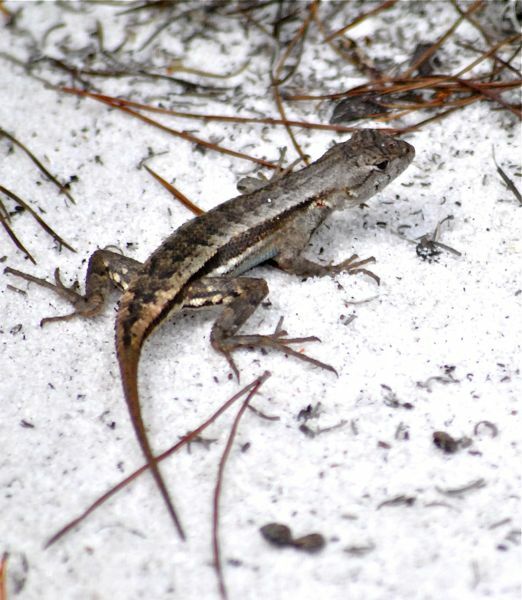 In parts of the state, namely the Ocala National Forest, the scrub lizard remains common, but along South Florida's coastal ridge, where remaining habitat is fragmented, they've become scarce. 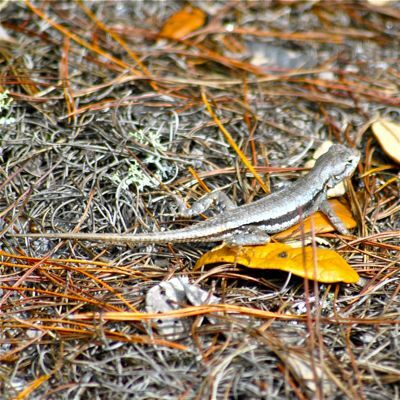 The lack of mobility has made the Florida scrub lizard genetically diverse. Scientists estimate that some populations have been isolated for a million years or more. Introducing lizards from one area to another could threaten that diversity and complicate attempts to conserve the species. Florida scrub lizards belong to Phrynosomatidae, the family of North American spiny lizards.